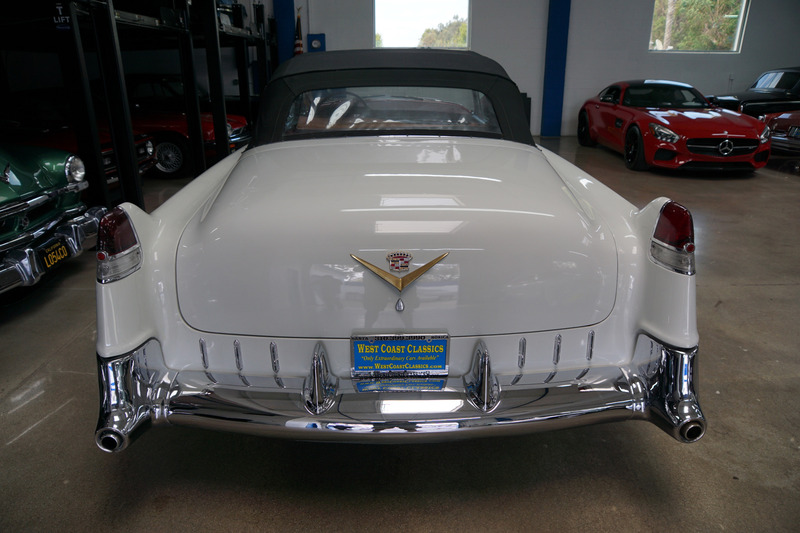 West Coast Classics are proud to present an absolutely exceptional and recently restored with no expense spared including new chrome, new leather seats, new power soft top, new brakes and tires, recent paint, a rebuilt engine, and great daily driving and completely rust free example of this 1955 Cadillac Series 62 Convertible with beautiful 'Alpine White' color paint and with a gorgeous condition 'Red' leather interior with factory specifications and options including power top, power steering, power brakes, power windows, heater and defroster, original AM radio, Autronic Eye Headlight Dimmer, rear fender skirts, windshield washers, electric clock, white sidewall tires and it's original 331/250HP V8 engine! 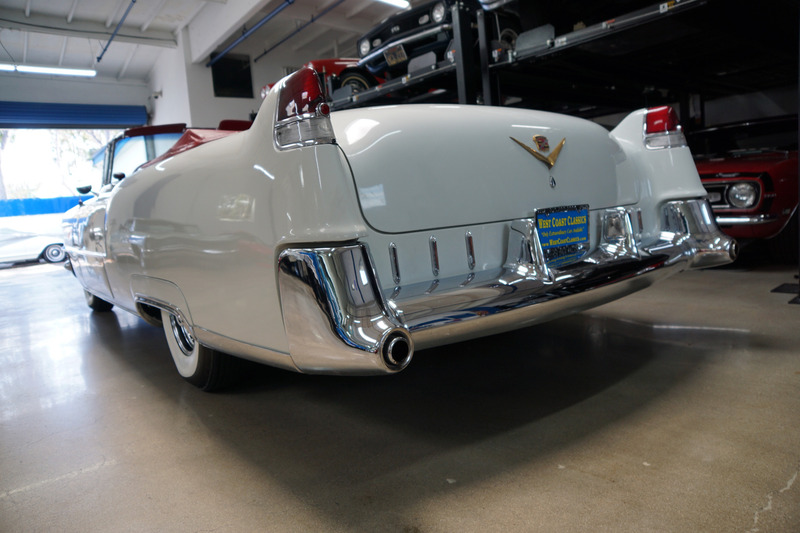 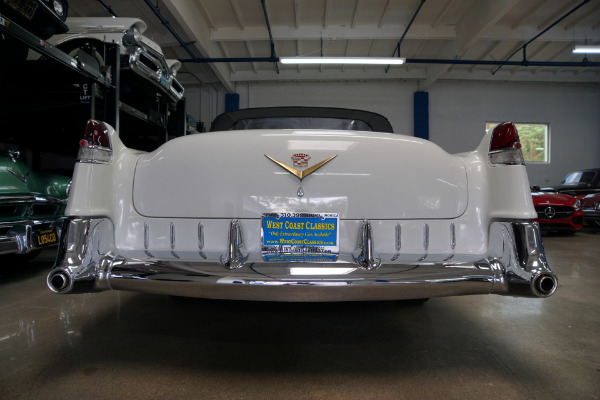 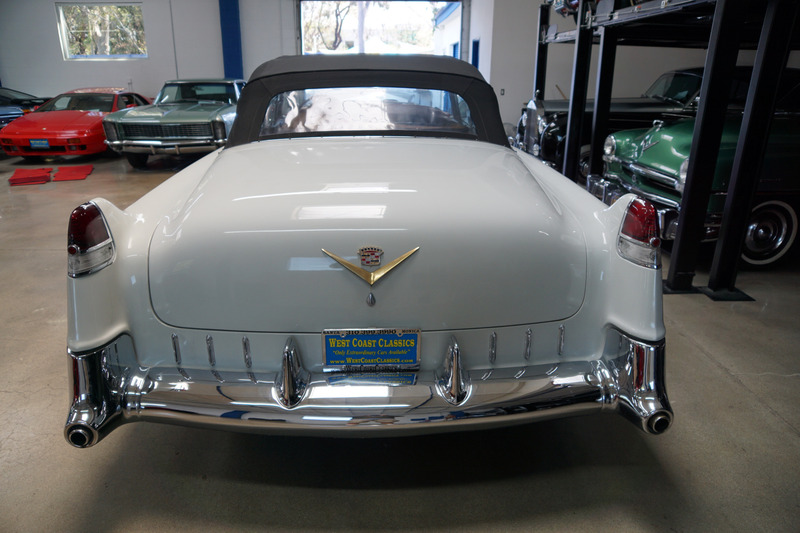 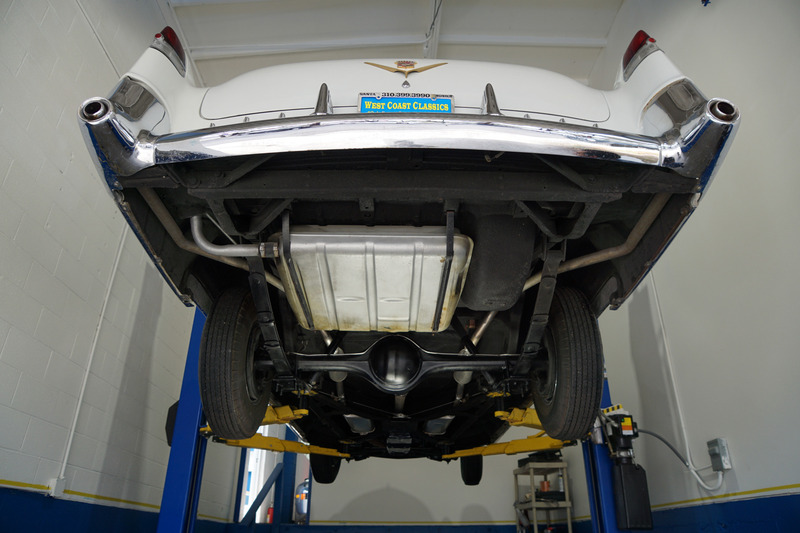 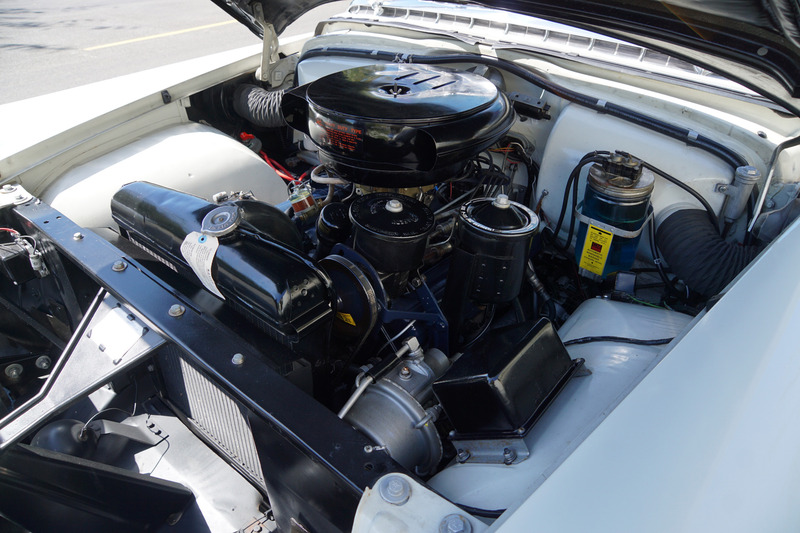 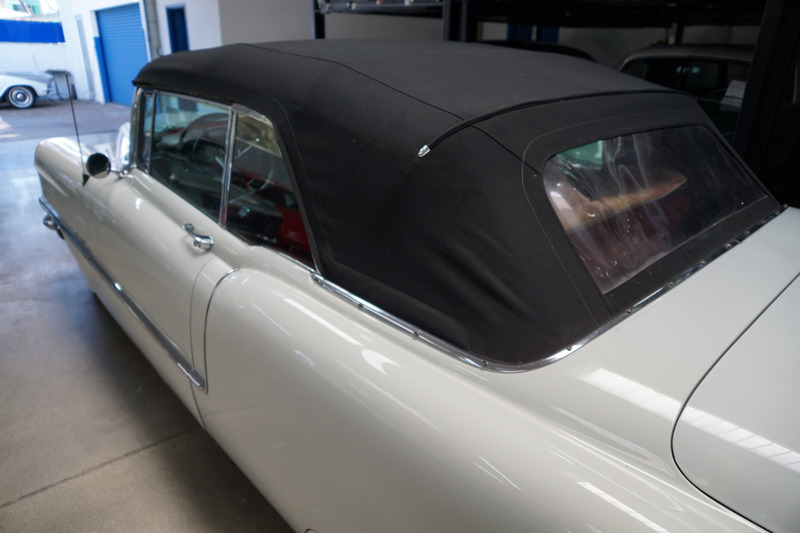 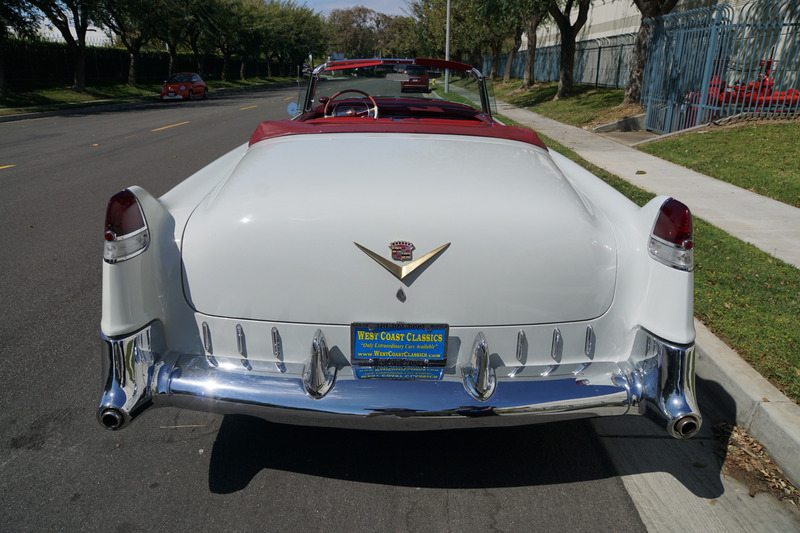 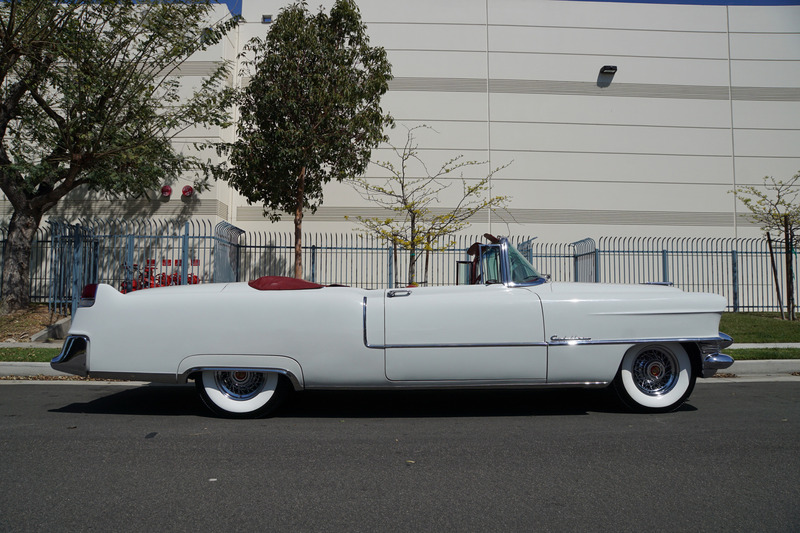 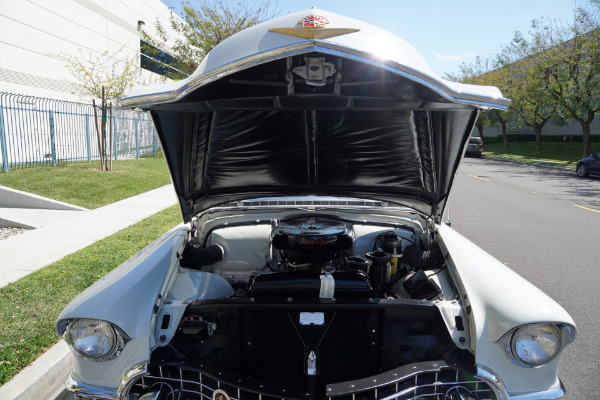 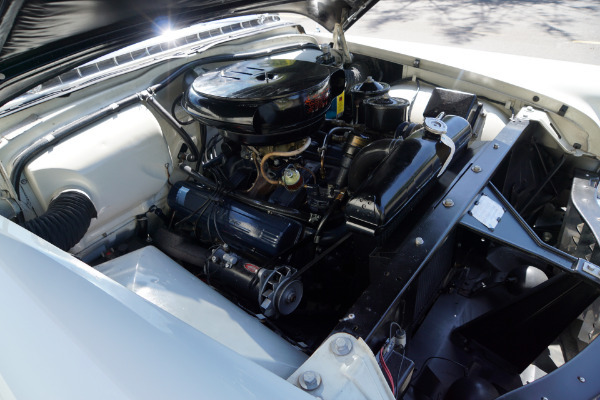 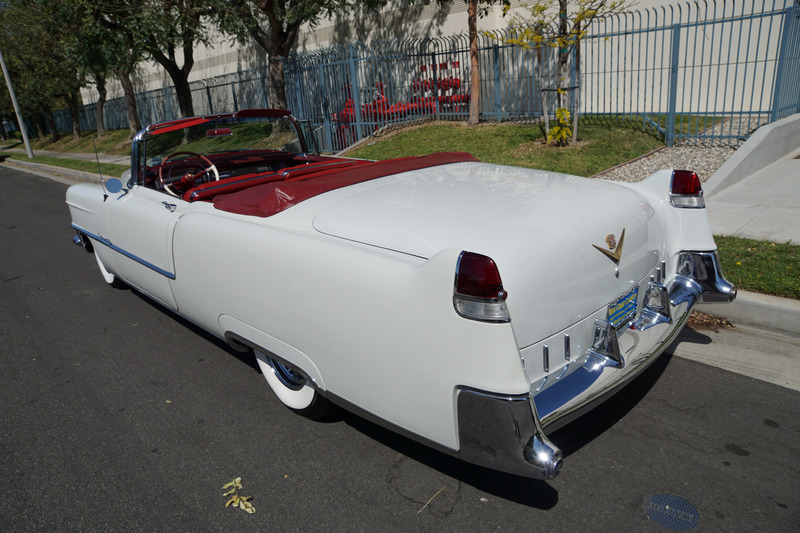 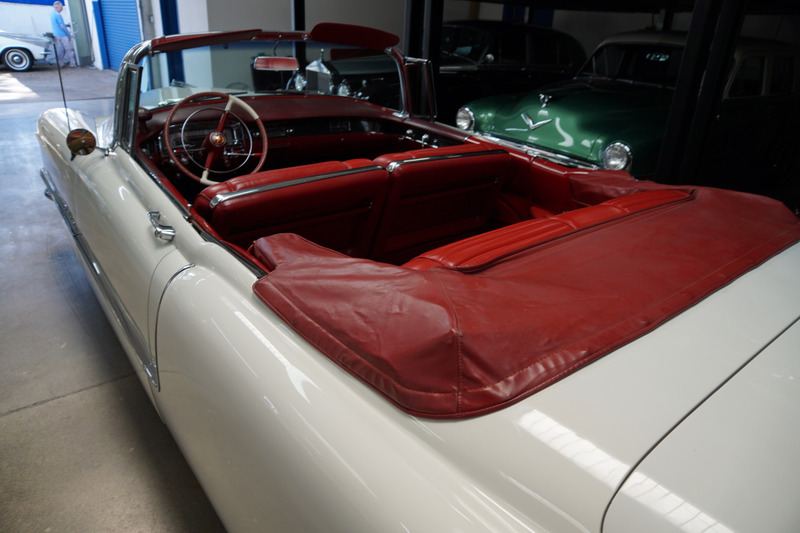 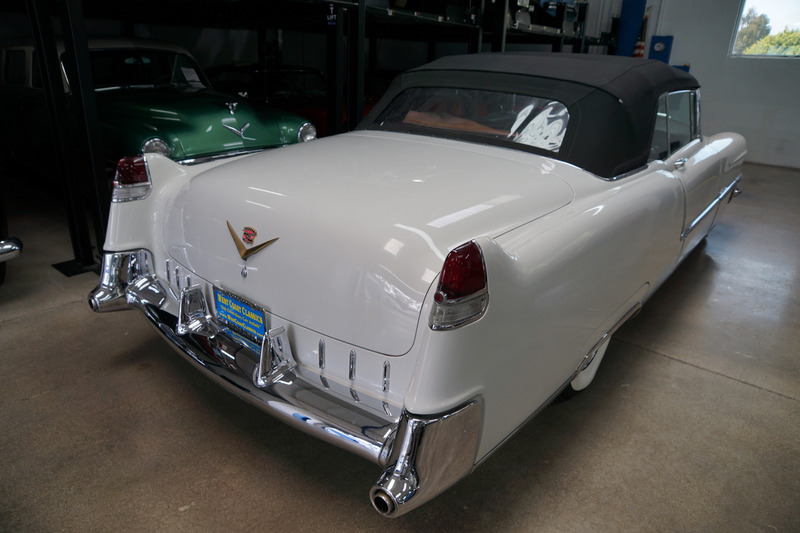 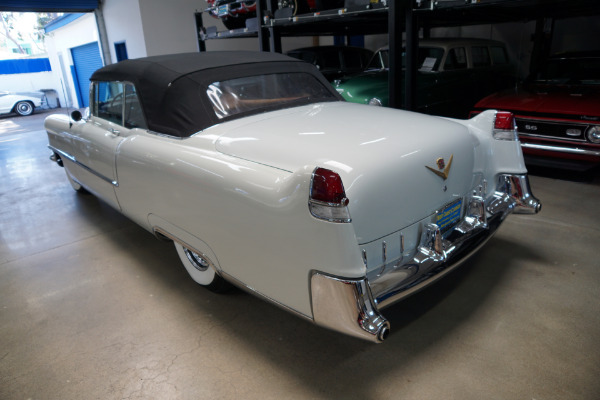 This is a truly superb example of a 1955 Cadillac Series 62 Convertible with a rebuilt engine & transmission. 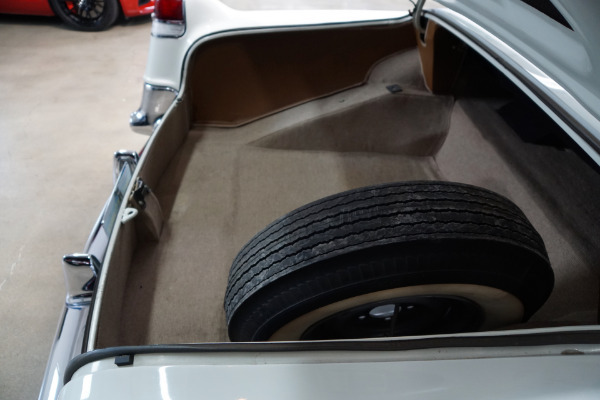 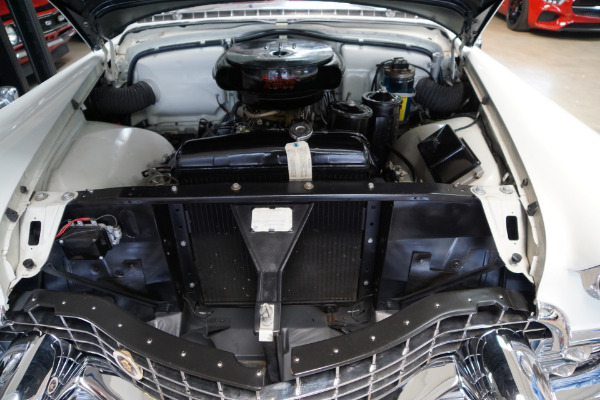 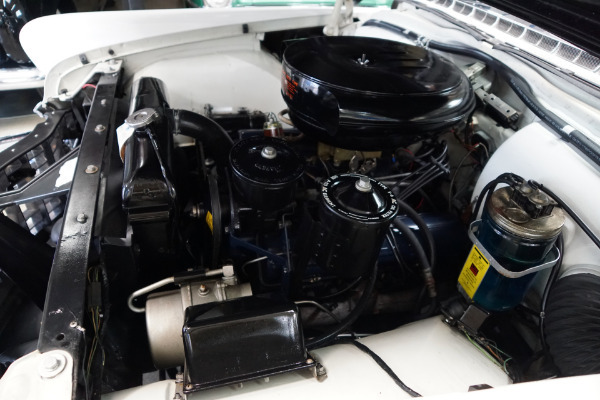 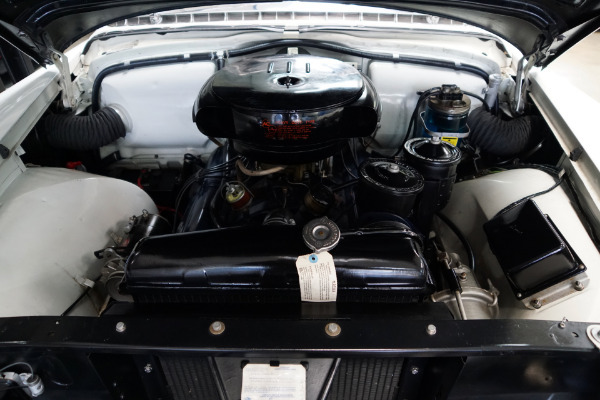 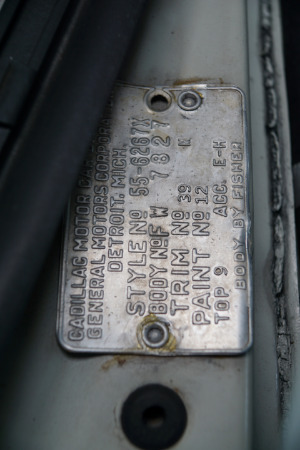 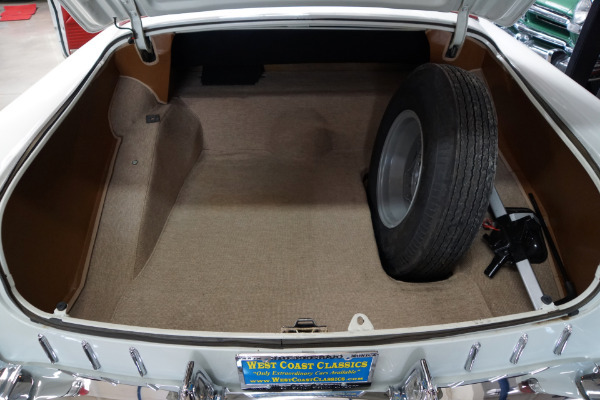 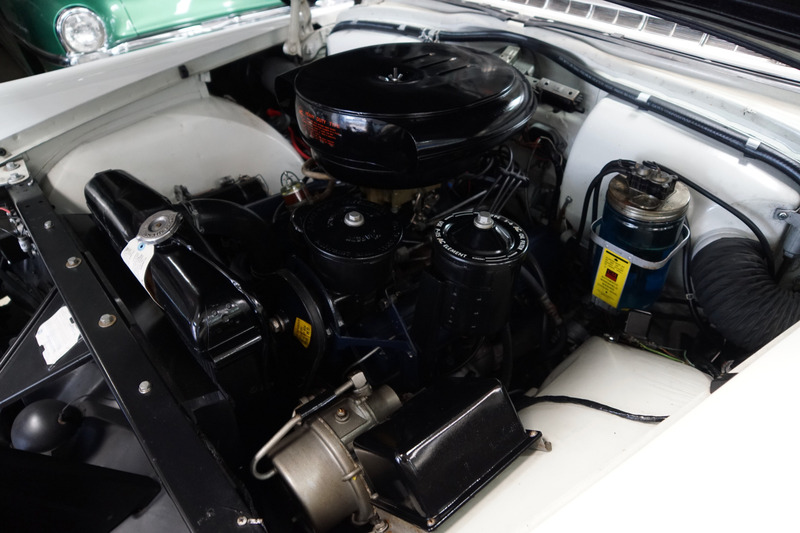 Options include; Power top, Power windows, Power Brakes, Power steering, rear fender skirts and the car has re-plated chrome, all the stainless is highly polished, the trunk has it's original lining material, the car boasts it's original factory AM radio and a new power soft top. 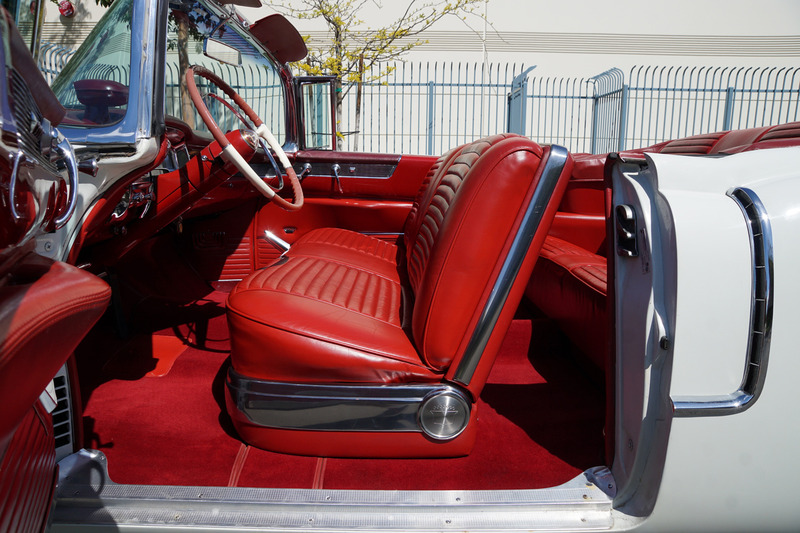 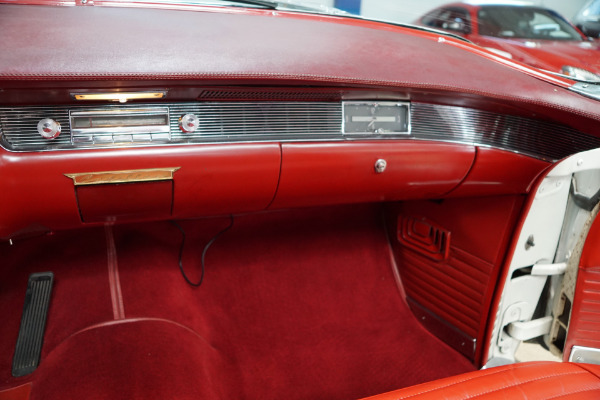 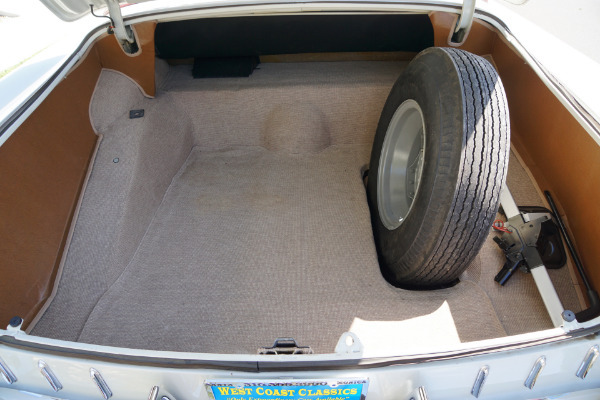 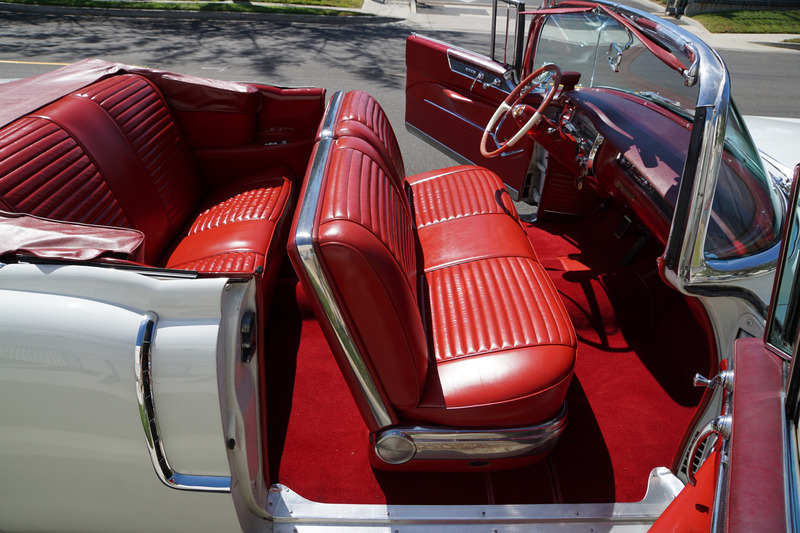 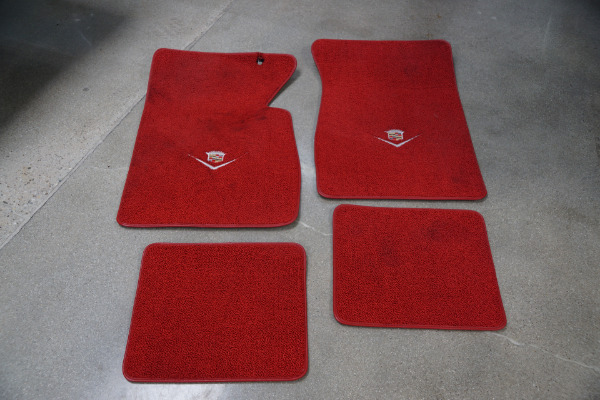 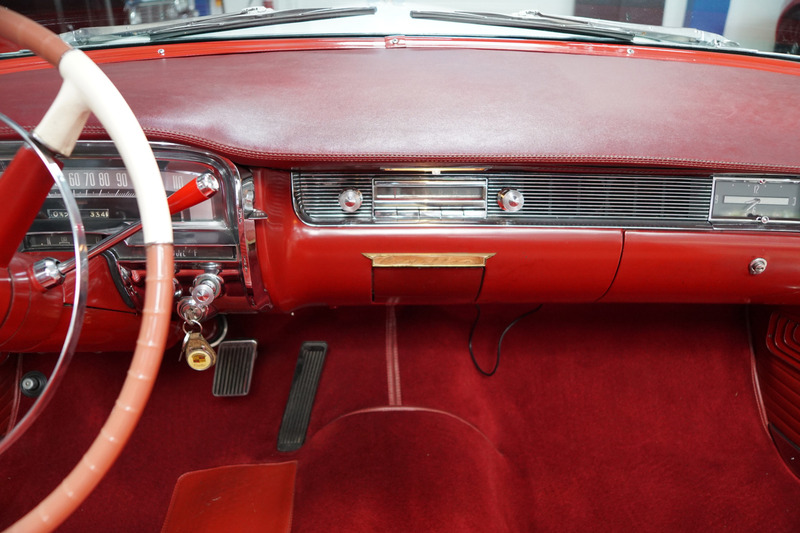 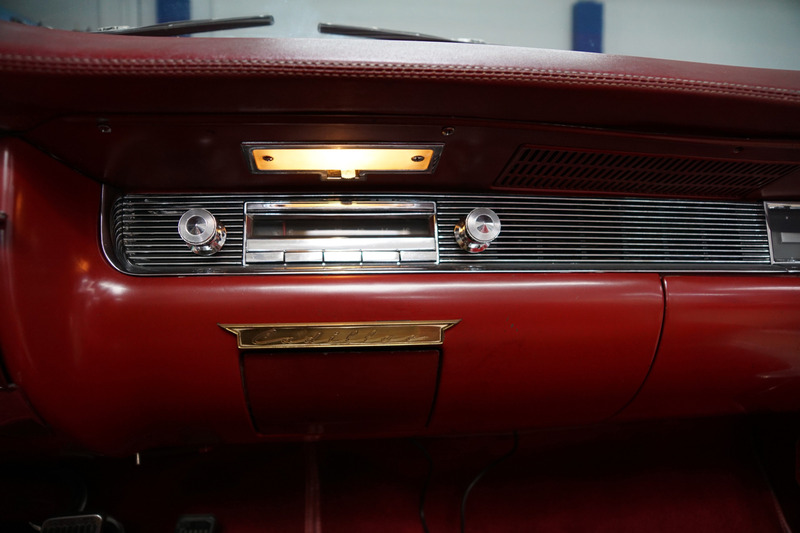 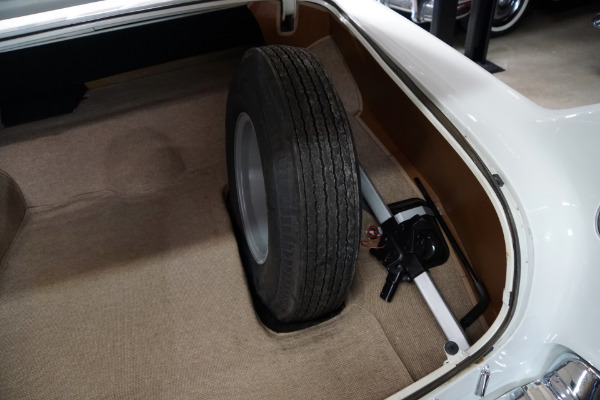 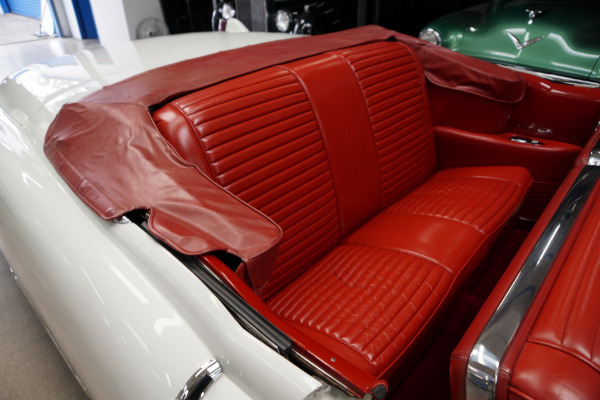 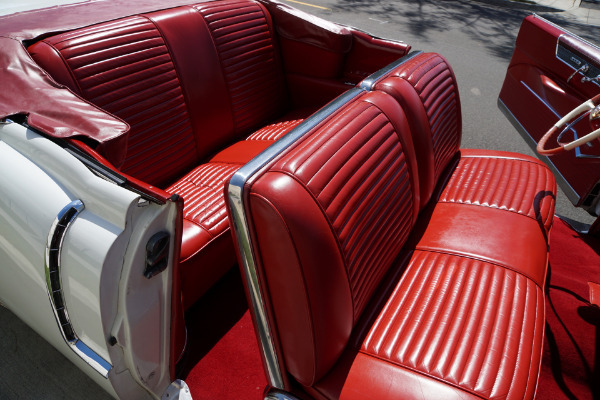 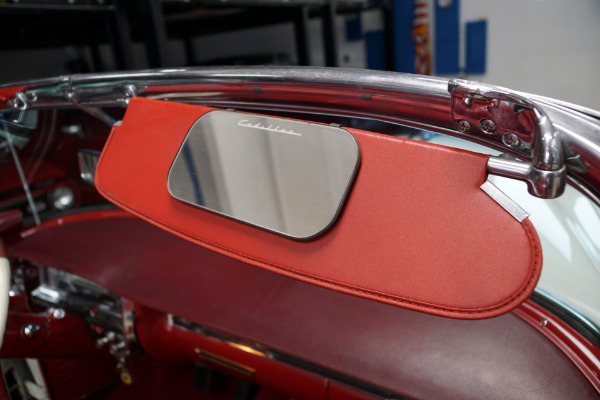 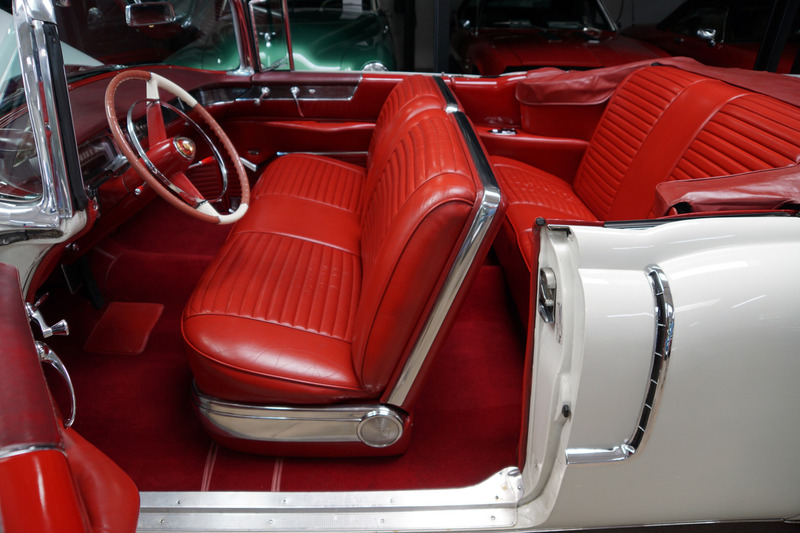 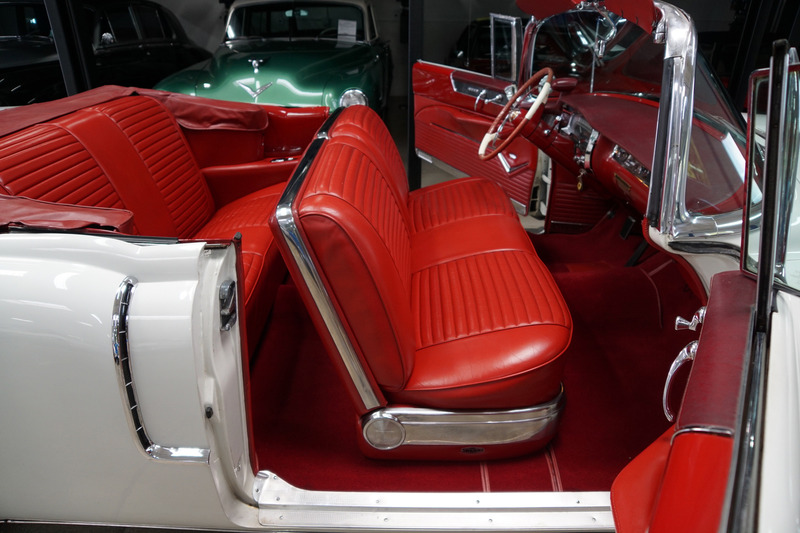 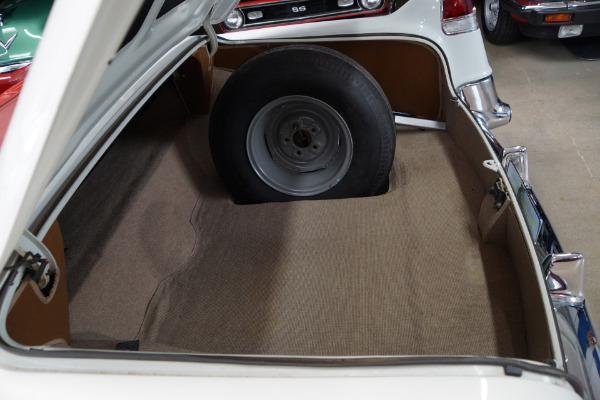 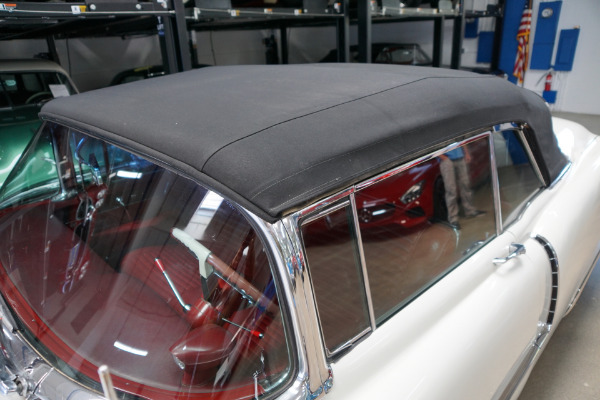 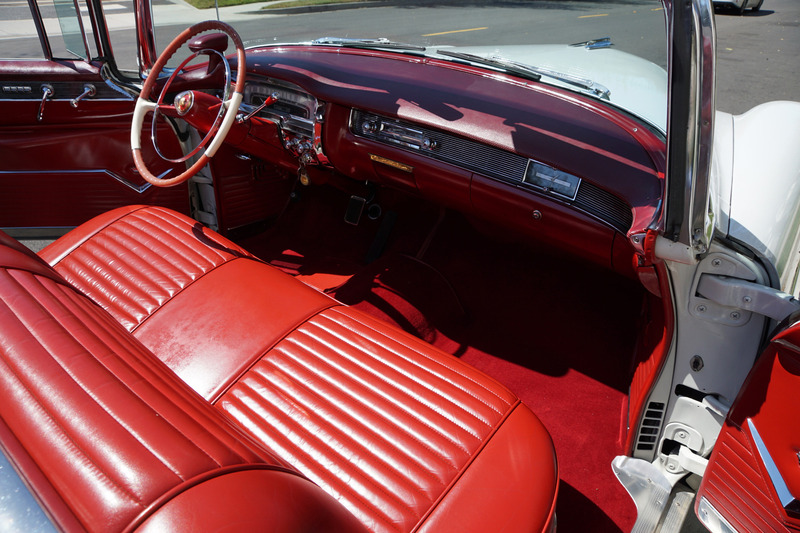 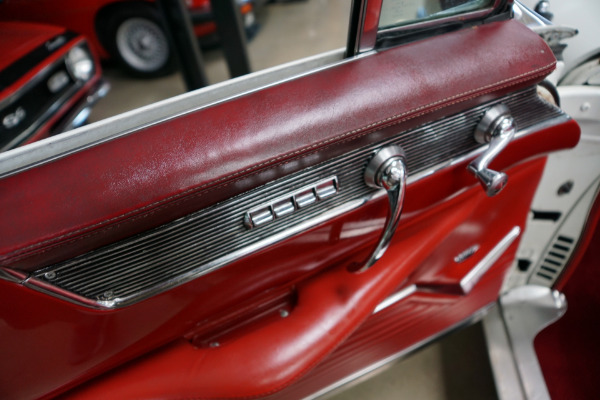 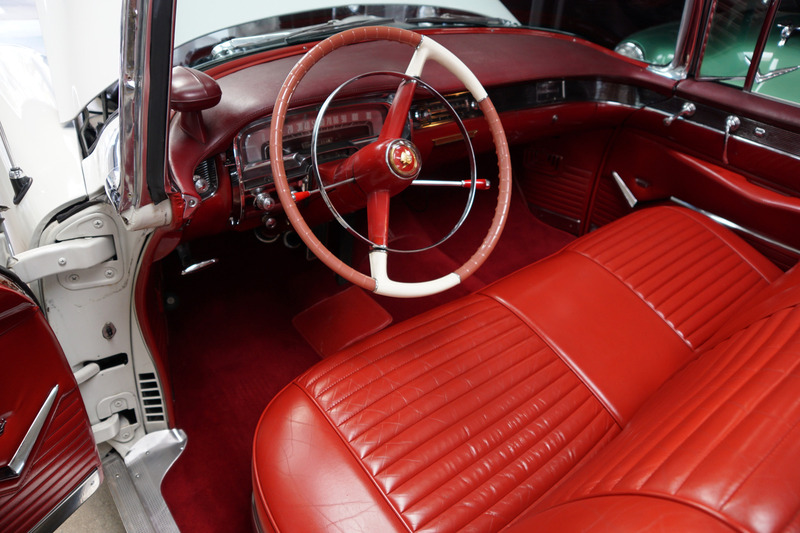 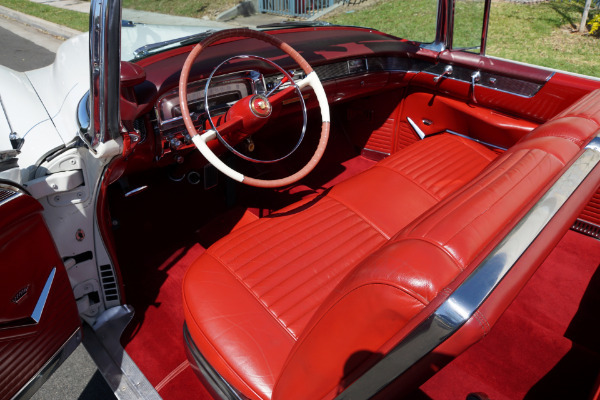 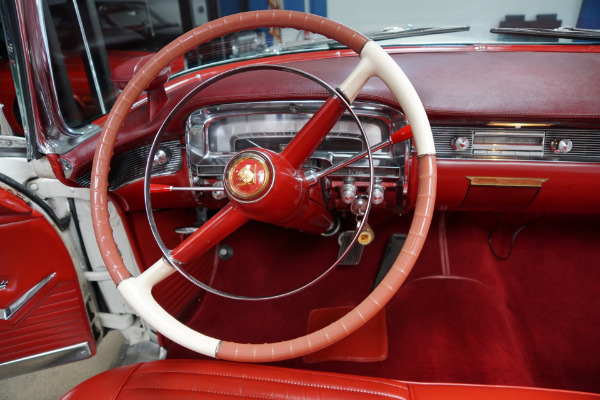 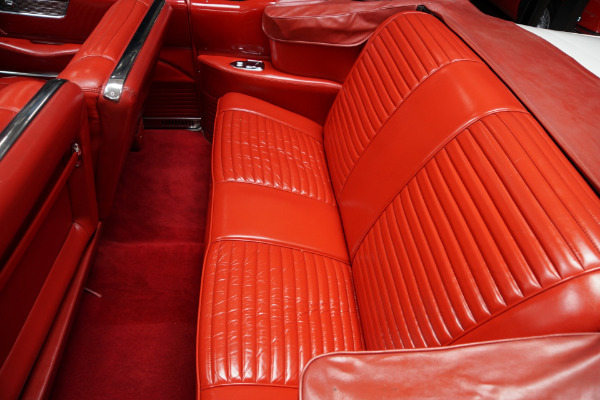 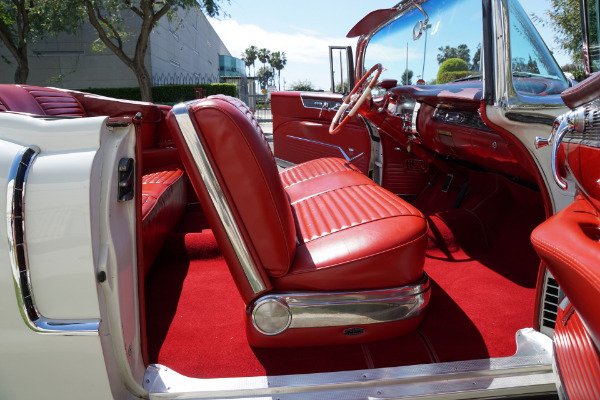 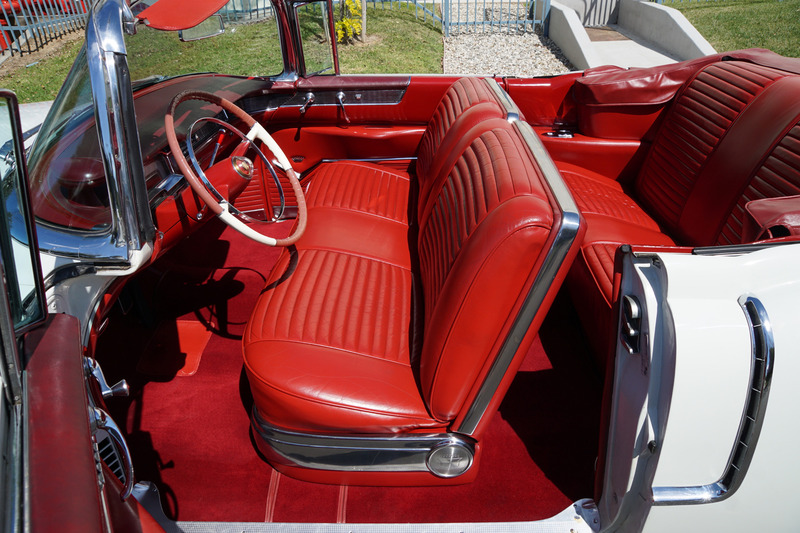 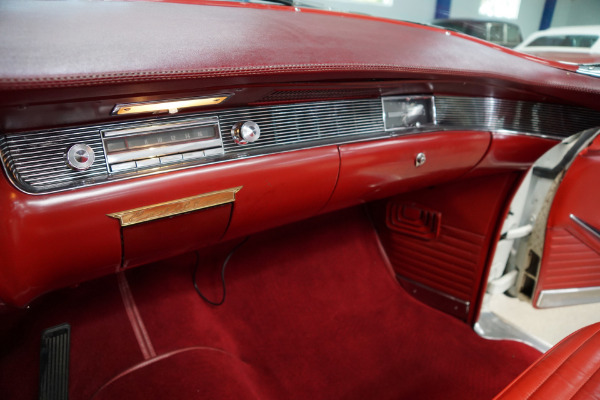 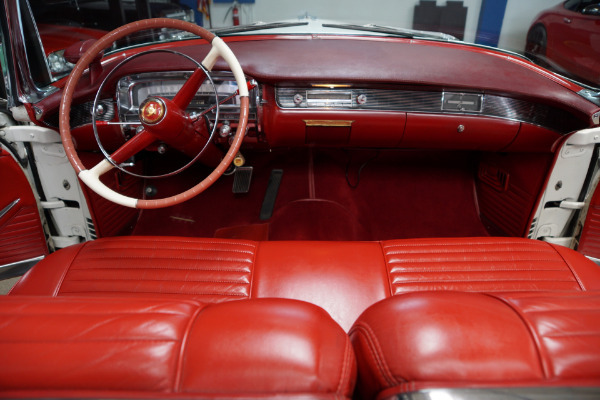 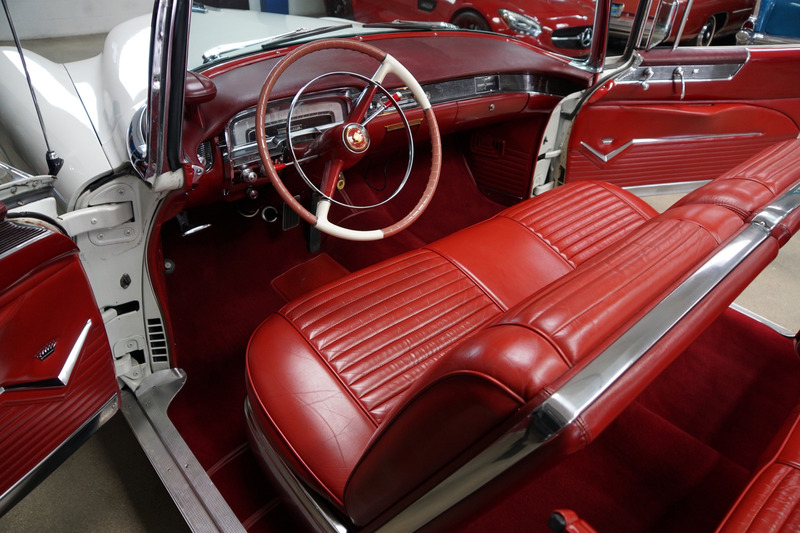 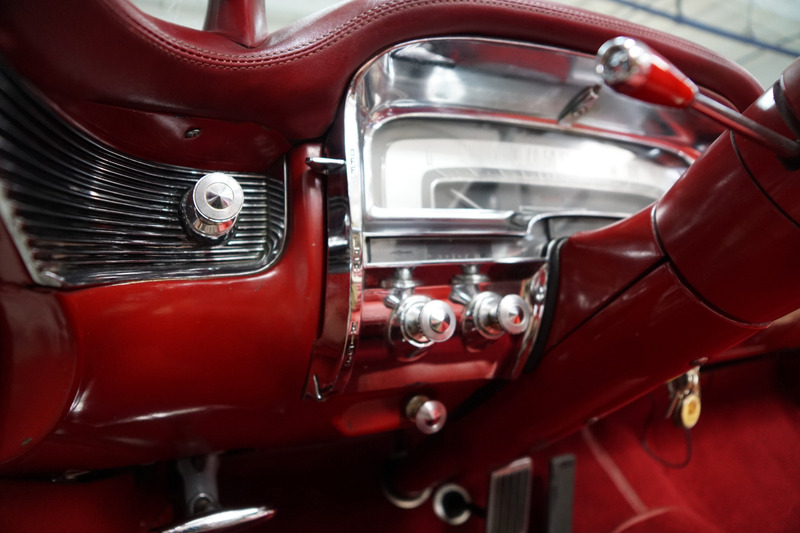 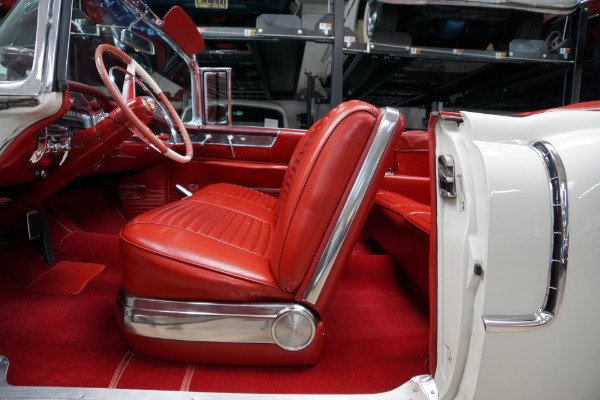 The car was repainted in a striking 'Alpine White' color from it's original 'Alabaster Gray' on an extraordinarily straight body and boasts it's original 'Red' color newly upholstered leather interior. 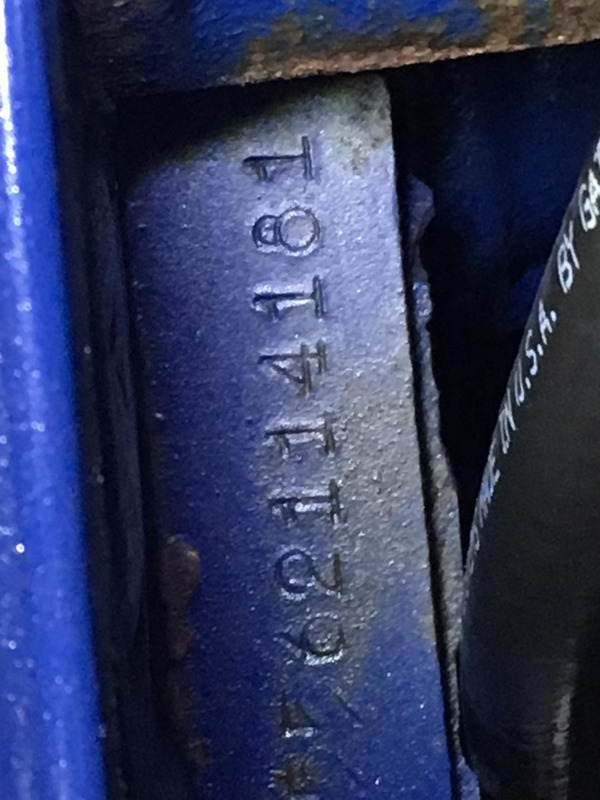 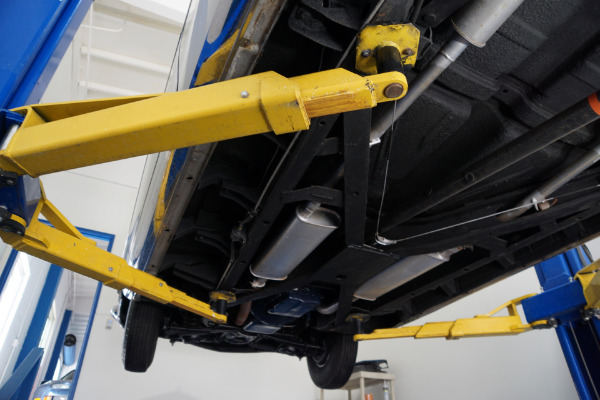 There are no signs of the car having ever been involved in any accidents and it has absolutely no rust. 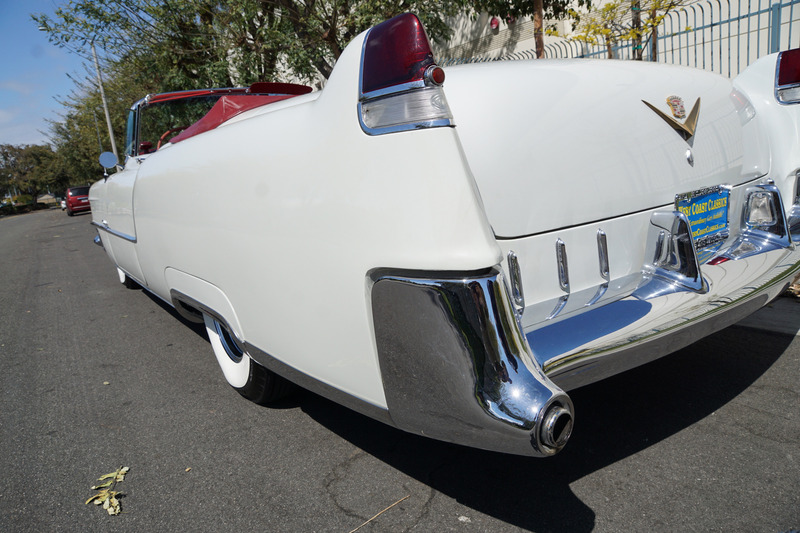 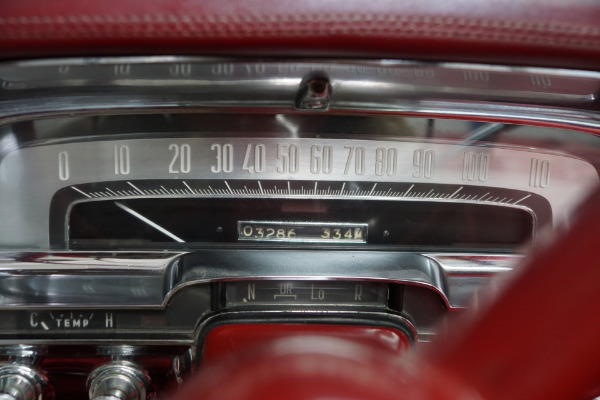 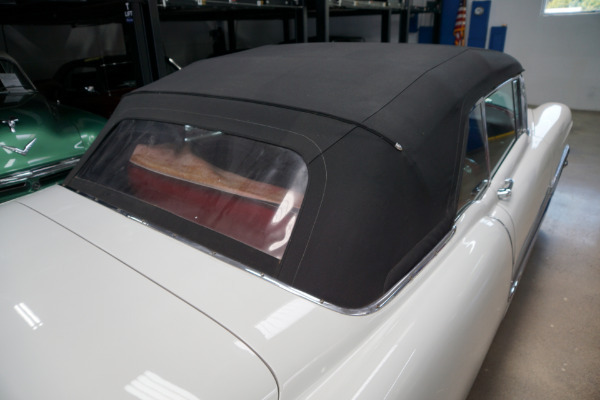 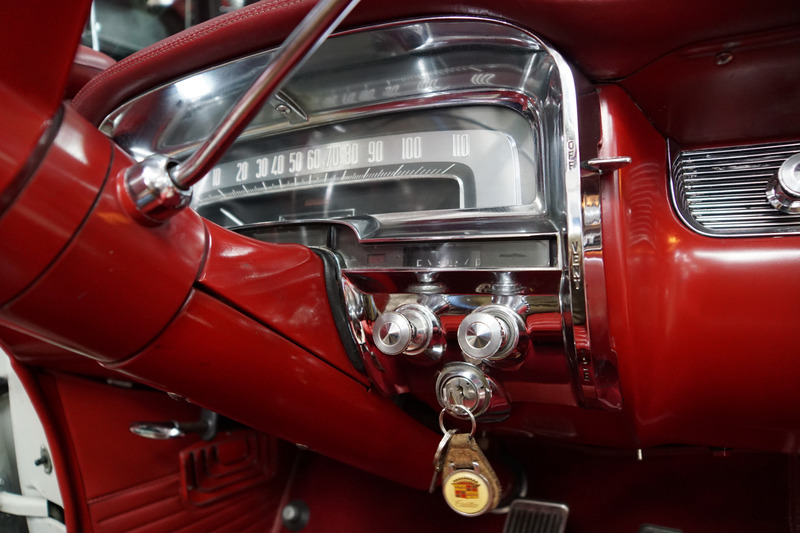 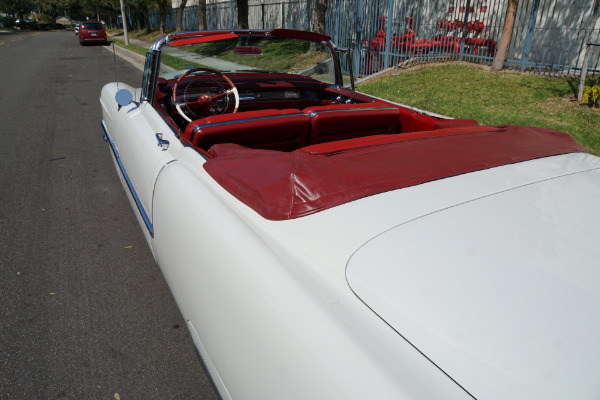 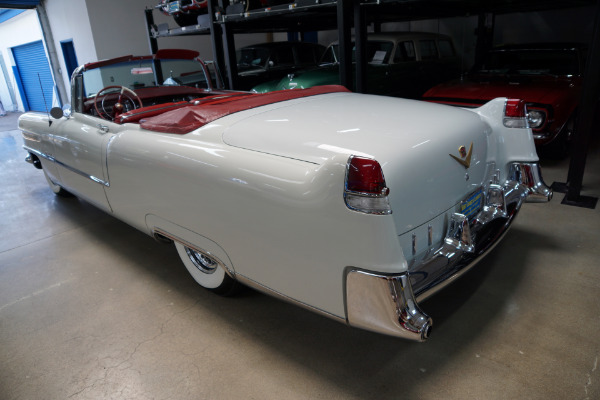 The 1955 Cadillac Series 62 convertible was one of the highest priced cars of its day - and with good reason - fifties excess had virtually reached its peak with Cadillac boasting bigger cars with more chrome and larger fins than ever before! 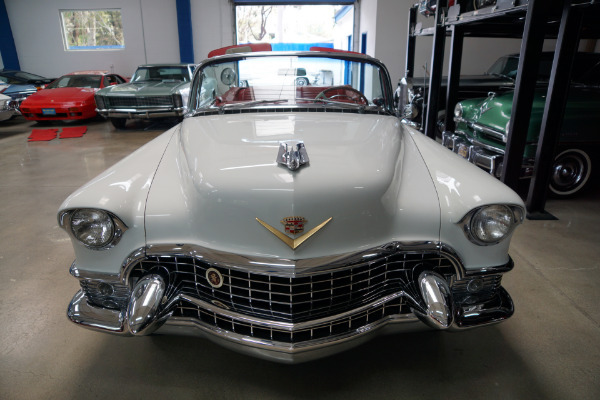 These cars bristled with the latest in modern appointments and had few rivals in the luxury market with a recession making owning one only for the very privileged elite. 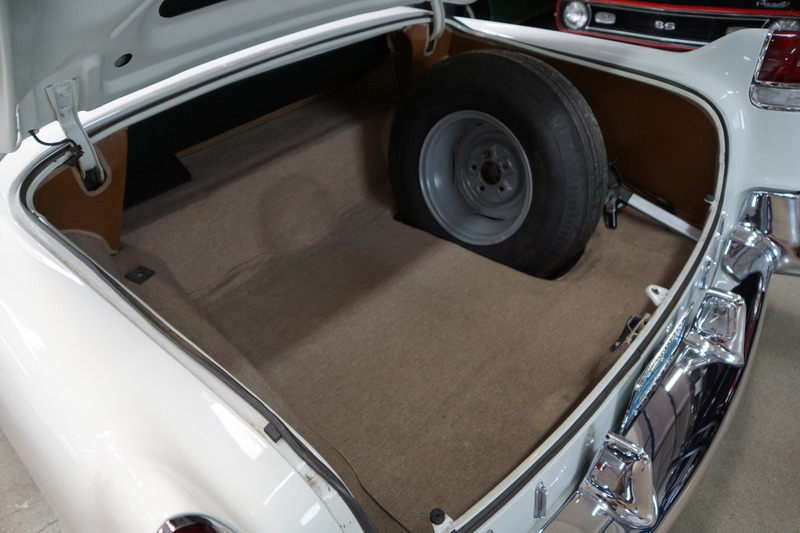 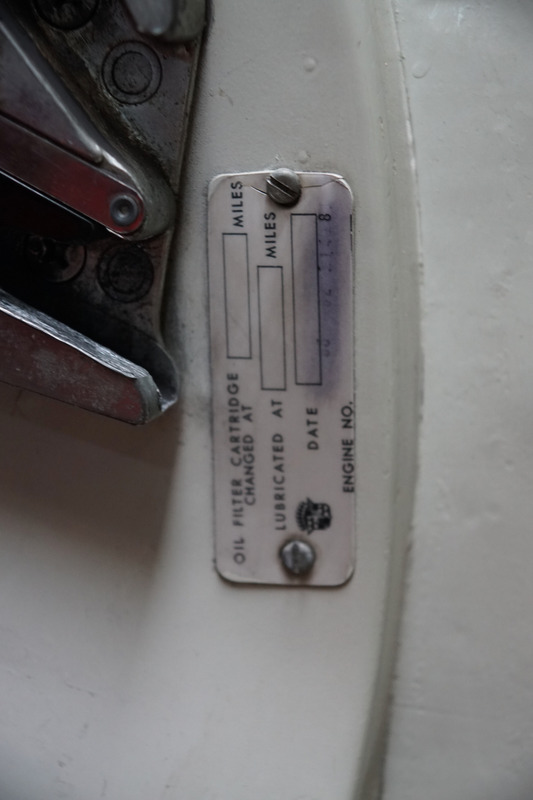 This particular example has obviously always been garaged and well maintained. 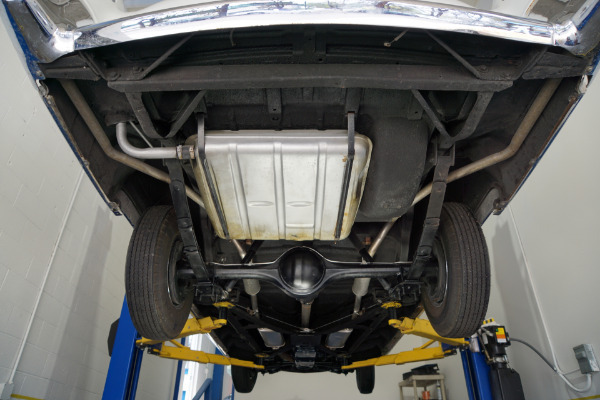 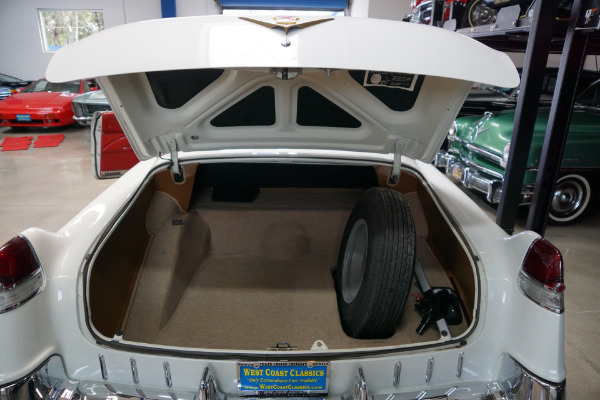 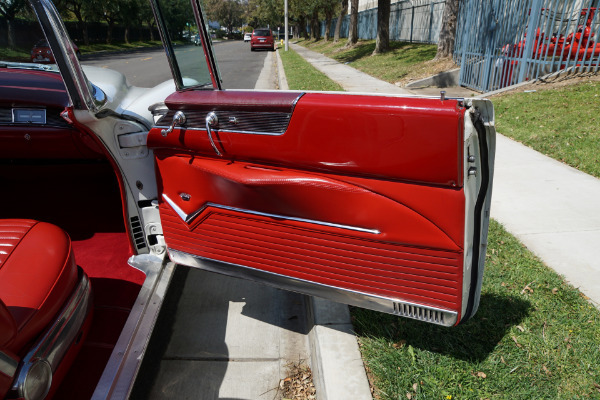 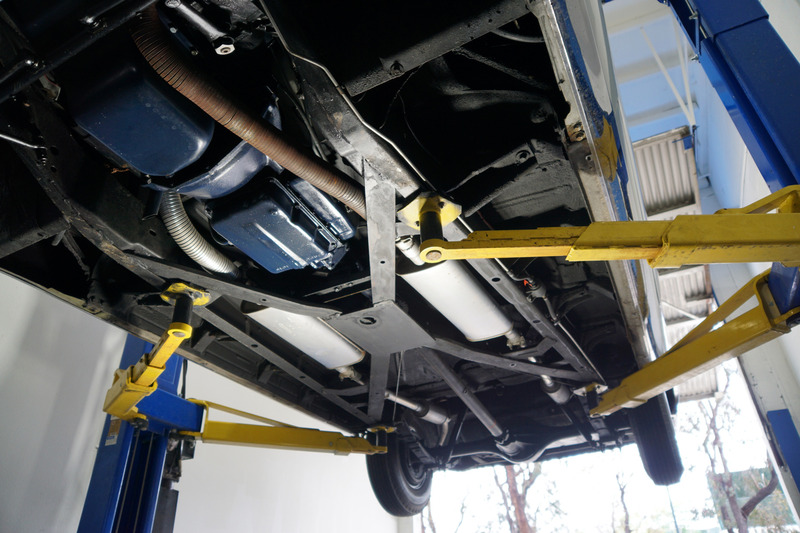 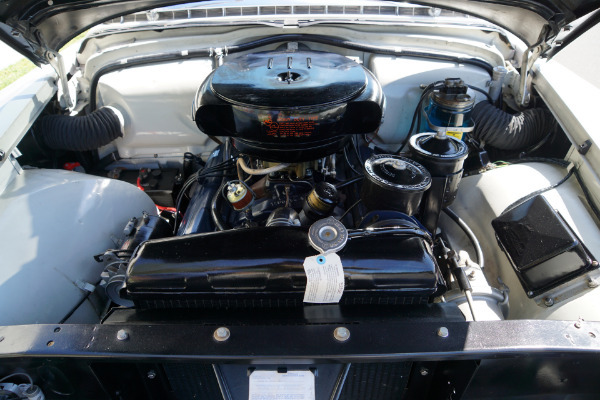 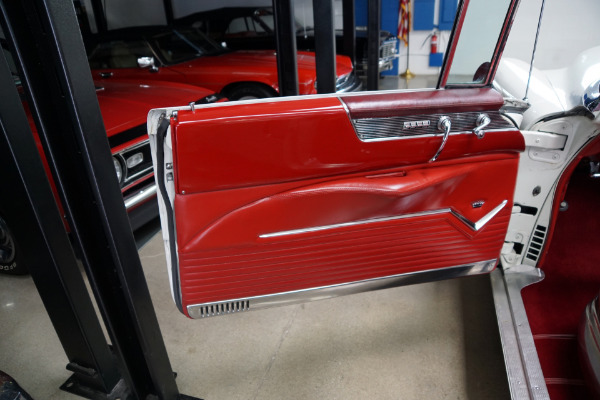 The floor boards, trunk and all the typical rust-prone areas are completely solid and rust-free and the car has no signs of any accidents anywhere - obviously an always cherished southern California 'Garage Queen' and a highly optioned car for it's day! 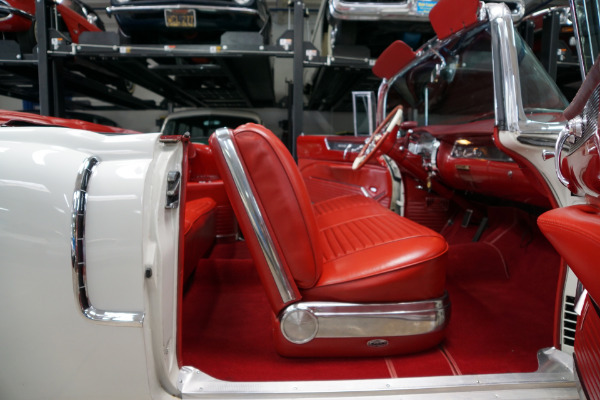 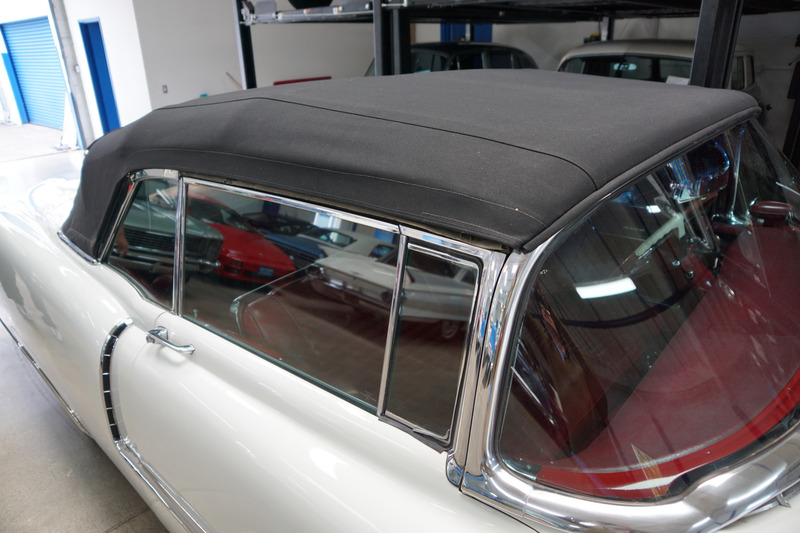 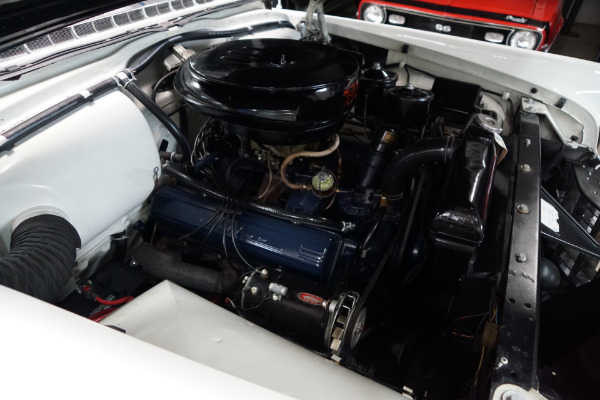 The car has beautiful 'Alpine White' color paint with a beautiful recently reupholstered 'Red' leather interior which is in exceptional condition throughout. 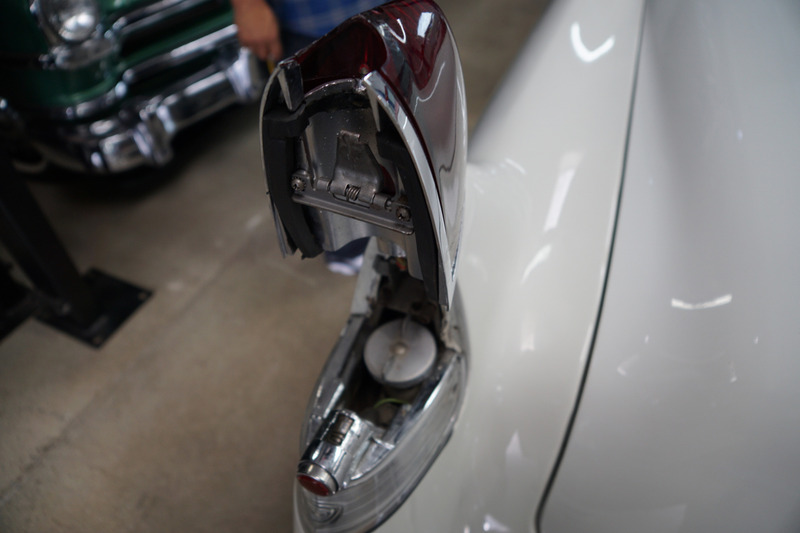 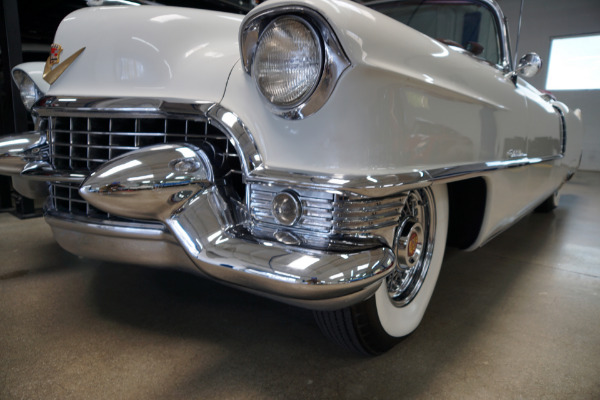 All the chrome has been very recently re-chromed and is in as new condition. 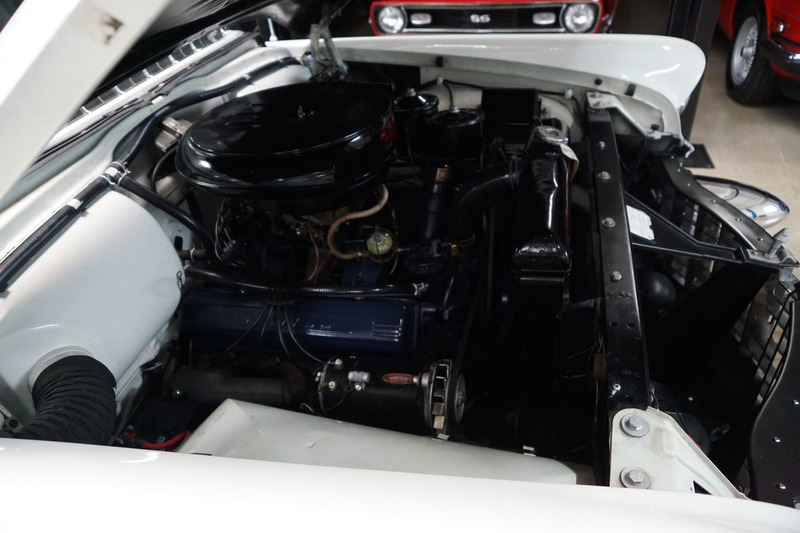 The original matching #'s 331/250HP V8 engine is extremely strong and powerful and sounds absolutely magnificent and this particular car drives absolutely magnificently - must be driven to be believed - does not miss a beat and purrs like a kitten - a truly remarkable daily driver that will give any modern day car a run for it's money! 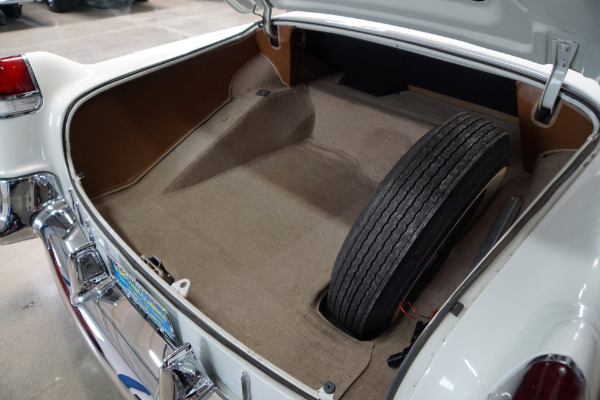 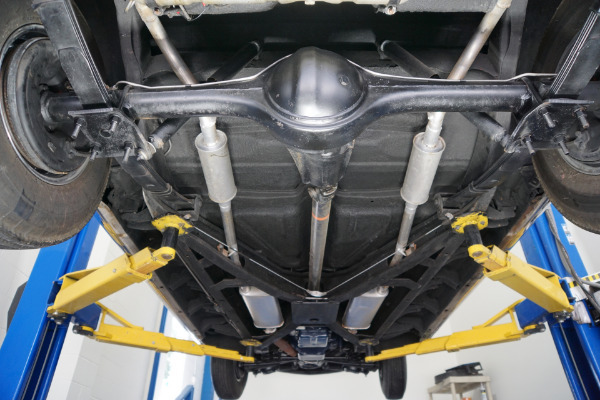 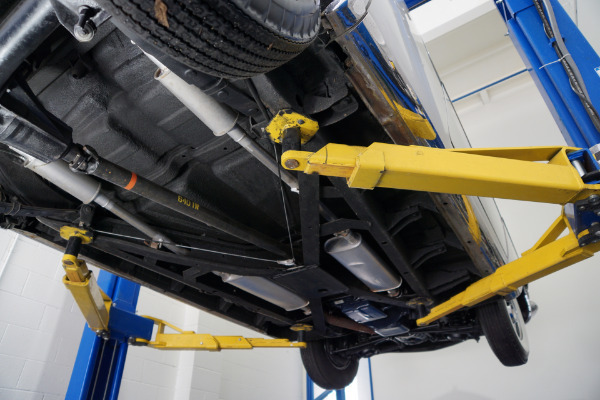 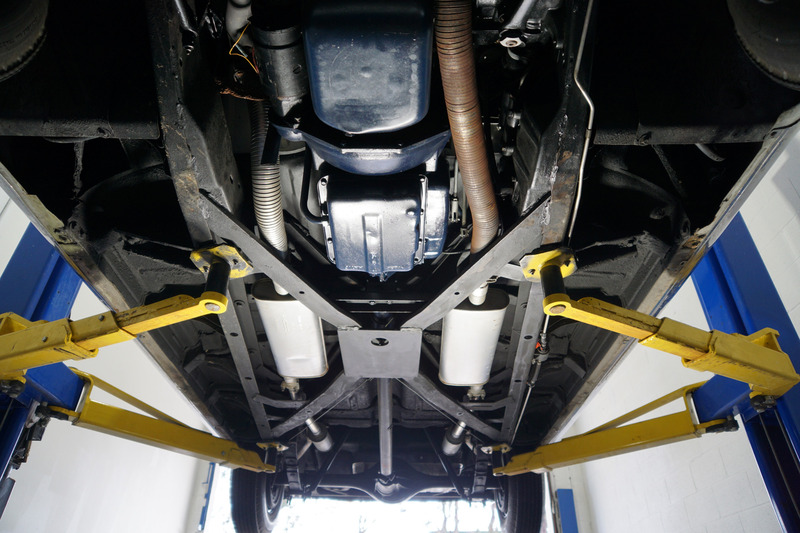 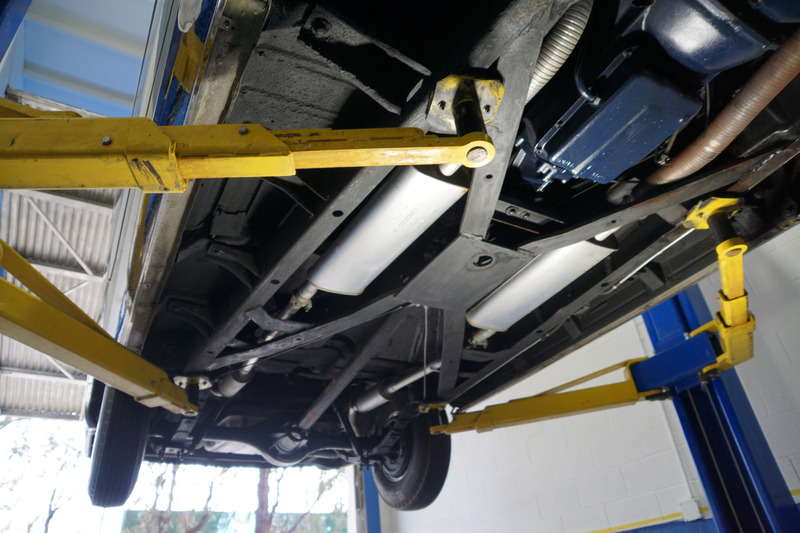 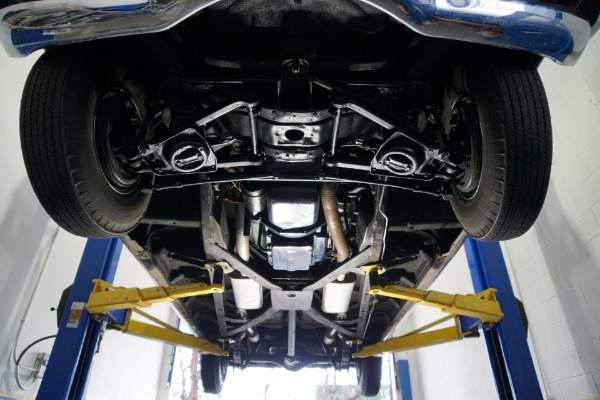 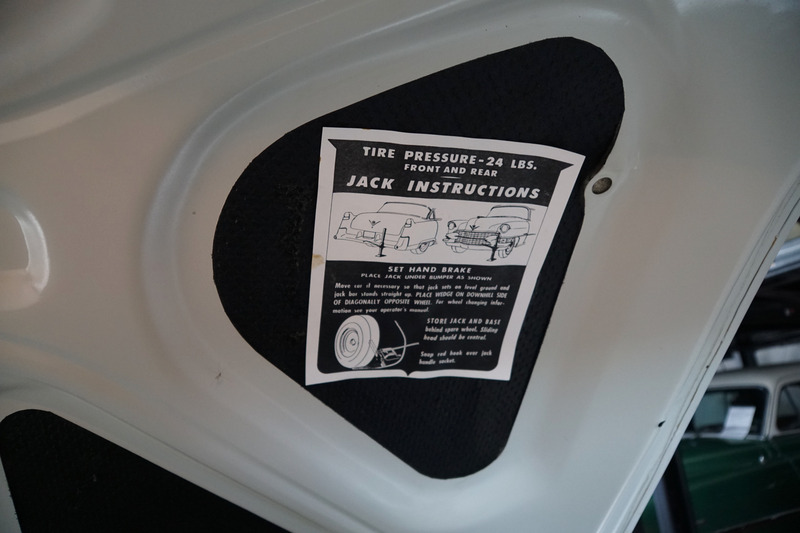 The transmission shifts smoothly through the gears and the car has four good white sidewall tires and its original factory hubcaps! 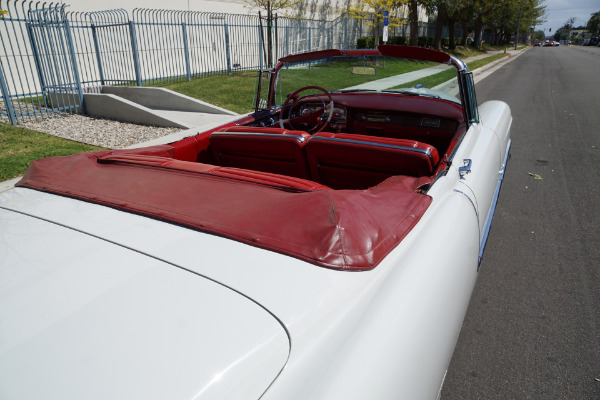 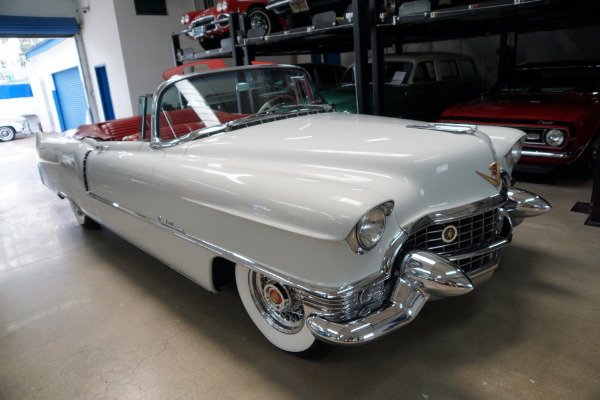 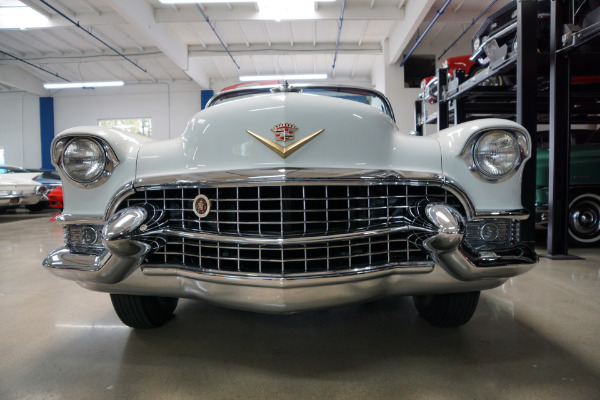 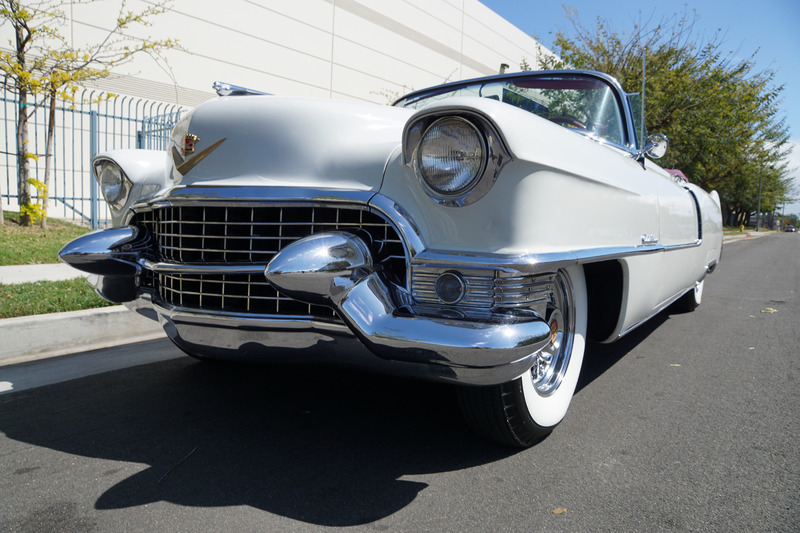 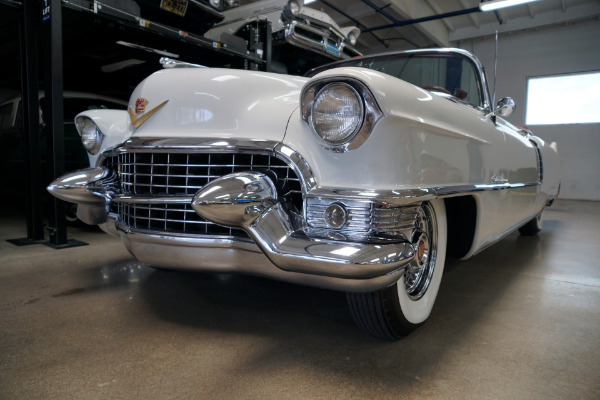 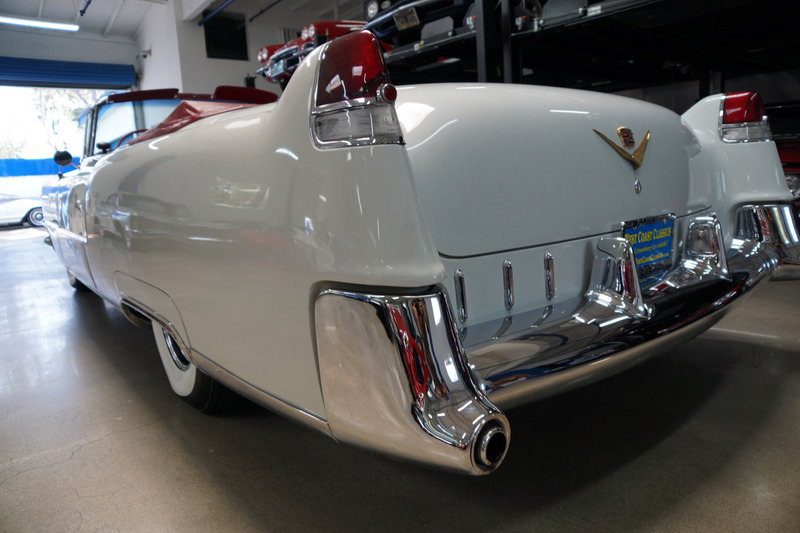 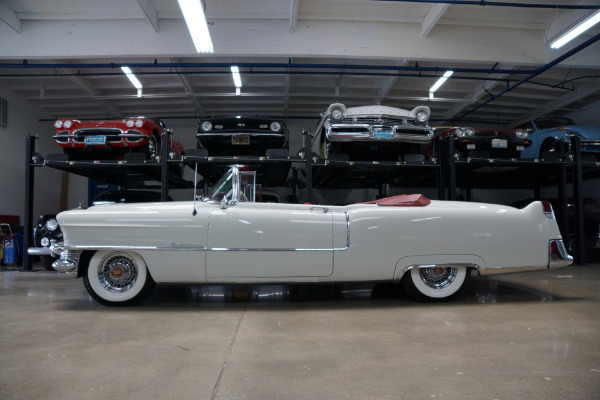 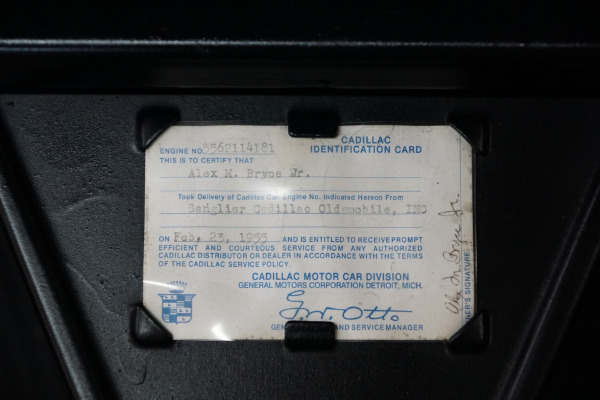 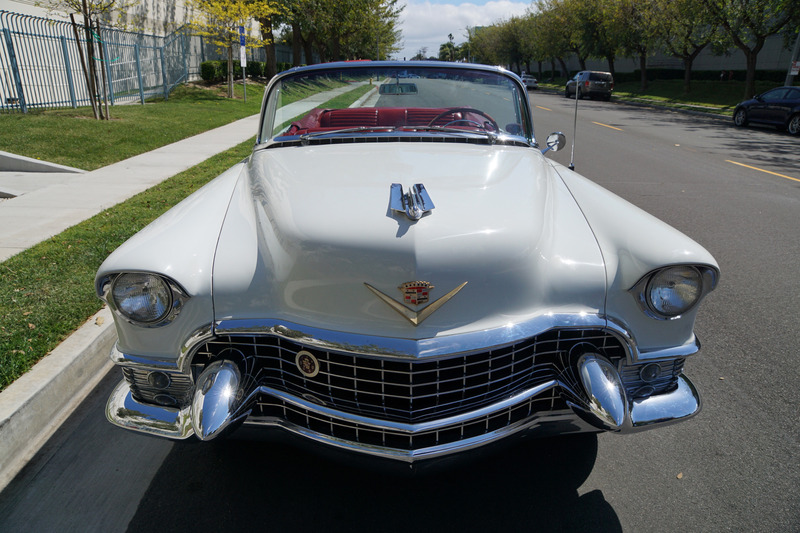 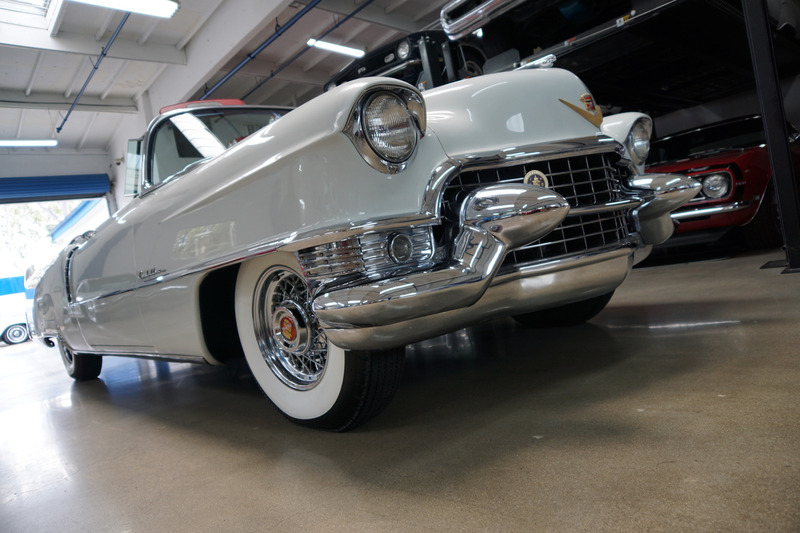 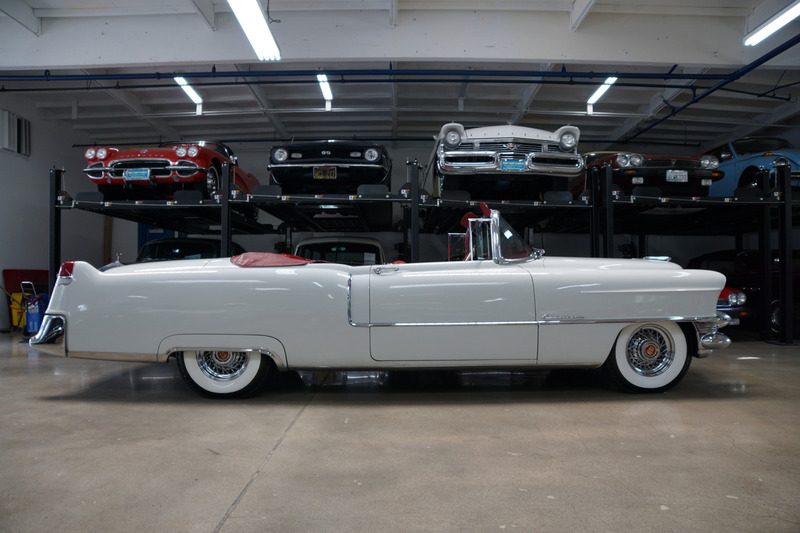 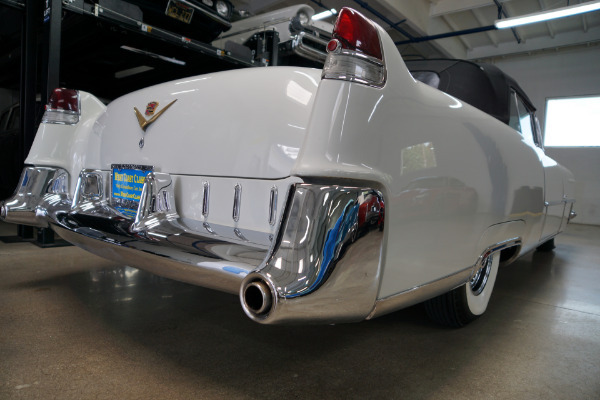 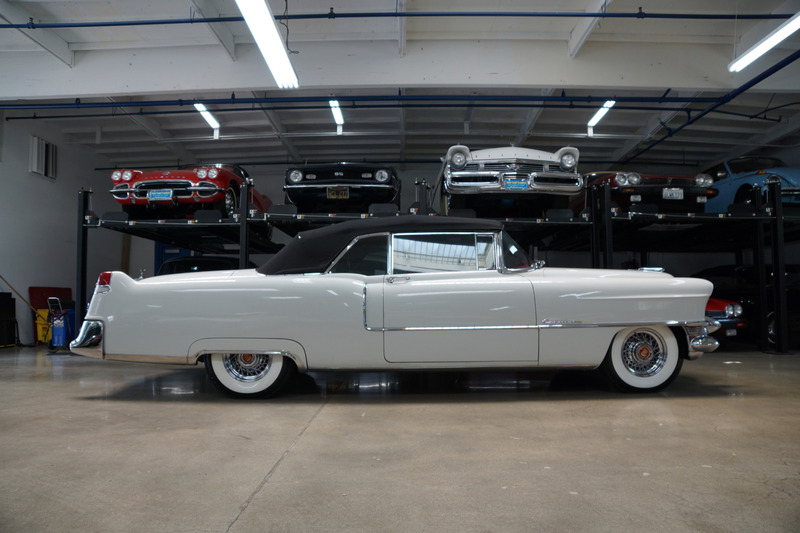 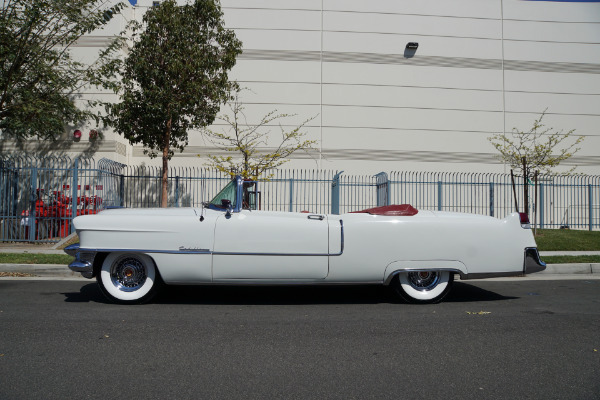 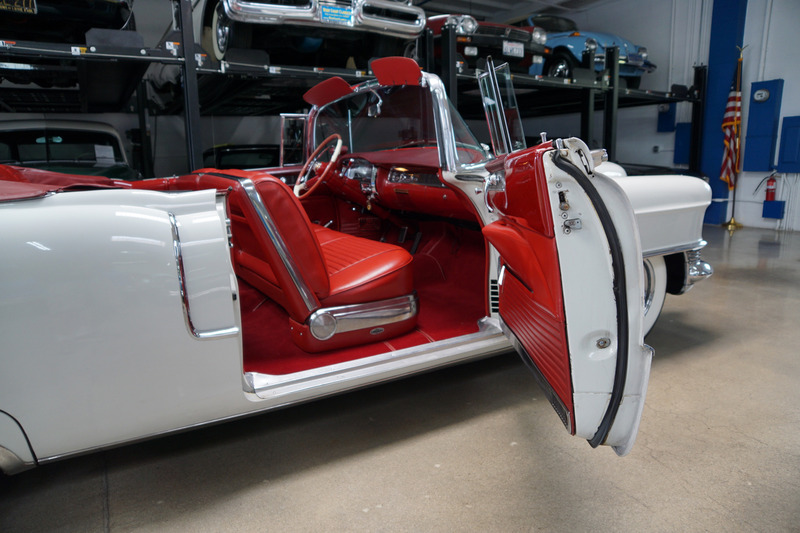 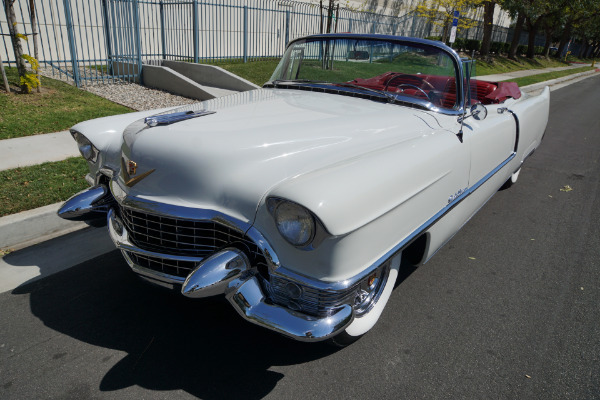 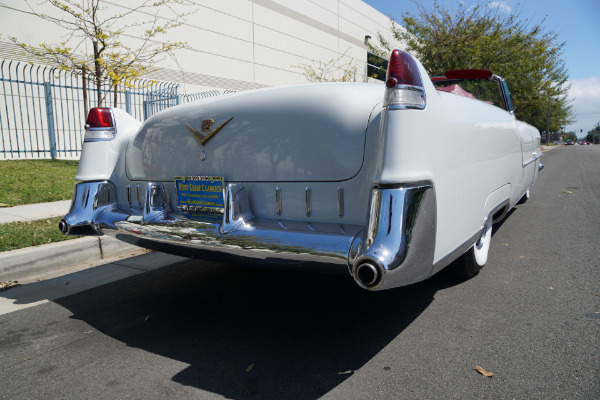 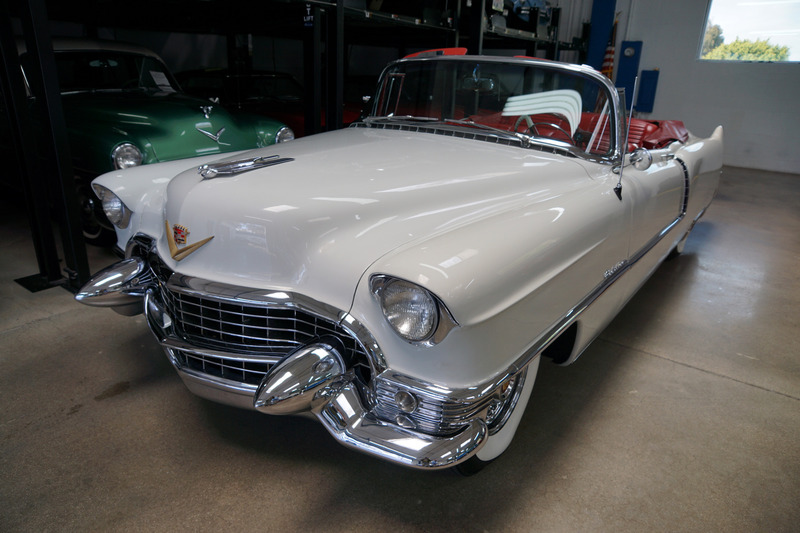 This is a rare opportunity to own a simply stunning example of a 1955 Cadillac Series 62 Convertible for the serious Cadillac enthusiast or collector. 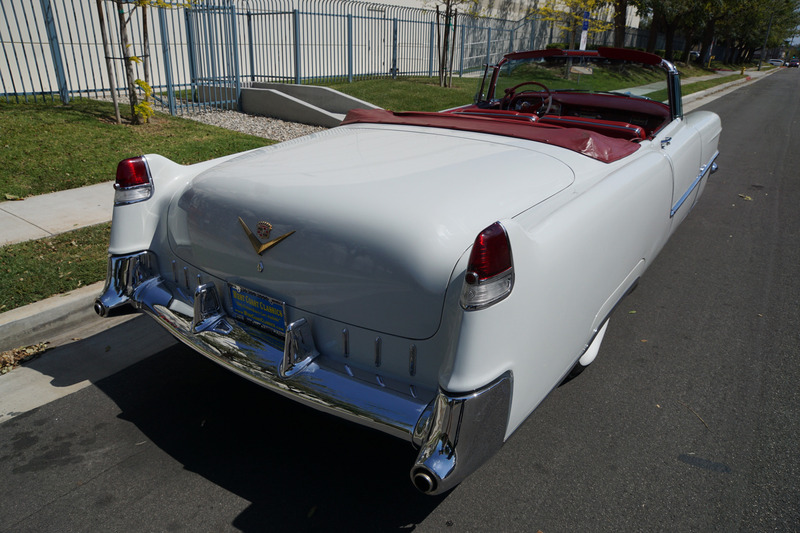 Few more correct or finer looking examples available anywhere else!